San Luis Obispo County supervisors have agreed in principle on a pilot program that will generate millions of dollars in additional funds for affordable housing, squelching a years-long board stalemate on its stagnant housing policies. The three-year plan involves a mix of new fees, possible taxes, and county contributions that will total $2 million to $4 million each year. Currently, the county only raises $100,000 per year for affordable housing. The revenue will go toward supporting affordable housing projects across the county, whose developers leverage public funds to receive grants and other outside funding. 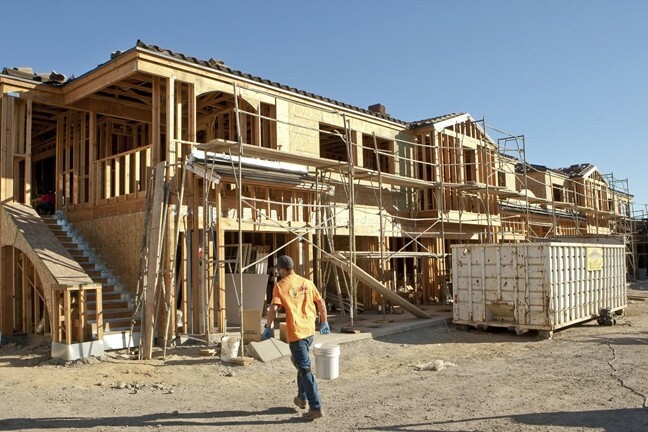 ROOFS OVER HEADS SLO County supervisors signed off on a three-year plan to boost funding for affordable housing, like the Las Lomas apartments in Atascadero (pictured under construction in 2013). All four supervisors at the Dec. 4 board meeting supported the plan (with 4th District Supervisor Lynn Compton absent), which was developed over several months by a team of local housing organizations and two supervisors. "It's fair to say we have seen a path forward," said 2nd District Supervisor Bruce Gibson, who worked with 1st District Supervisor John Peschong on the initiative. "We have a set of options that are going to work if we apply ourselves to it." The most immediate action the county will take is to increase the fees that are charged to for-profit developers on housing projects—called inclusionary housing fees. The fees have only minimally increased since they were introduced in 2008. To shield "smaller" homes from fees, the first 2,200 square feet of a unit will be exempt. County officials say they'll generate $1.1 million per year (compared to $1.4million if the minimum square-footage was set at 1,800 square-feet). Another near-term funding measure is a vacation rental impact fee. SLO County says its 1,377 vacation rentals could generate $675,000 to $920,000 per year through a $2.73 per night surcharge—the rate in the city of San Diego. That fee would require a nexus study before it can be adopted. Longer-term funding mechanisms include increases to the transient occupancy tax (to generate $1.06 million annually) or sales tax ($2.5 million to $12.5 million); a tax on second homes ($648,000); and an affordable housing bond (up to $140 million). All of these measures would require voters' approval in an election. As part of the plan, the county will also reform its in-house CEQA (California Environmental Quality Act) guidelines "to streamline housing projects," as well as pursue a "regional infrastructure and housing plan" in coordination with the seven local cities. "I'm grateful for such a robust package of options," said 3rd District Supervisor Adam Hill. "I don't think there's anything we can do that's more important to economic development." The plan earned effusive support from the housing and economic groups involved in the effort: the Home Builders' Association of the Central Coast, Peoples' Self-Help Housing, the Housing Authority of SLO and Paso Robles, the SLO County Housing Trust Fund, Habitat for Humanity, the SLO Chamber of Commerce, and the Economic Vitality Corporation. Peschong, who, with Gibson, bridged the ideological divide on the politically split Board of Supervisors, tied his support of the plan to the overwhelming community consensus.